HUD and the Census reported new home sales up 1.5 percent in March over February at an annual rate of 417,000 per year. Except for the January outlier rate of 445,000, this is the highest rate of sales since the end of the home buyer tax credit in early 2010. The first quarter average is 424,000 annual sales, which is the highest since third quarter 2008. Regional activity was mixed with the Northeast and South up (21 and 19 percent respectively) and the Midwest and West down (12 and 21 percent respectively). Inventories continue near historic lows at 153,000 homes and a mere 41,000 homes completed and ready to occupy. In a normal market, there are about 100,000 ready-to-occupy new homes for sale. 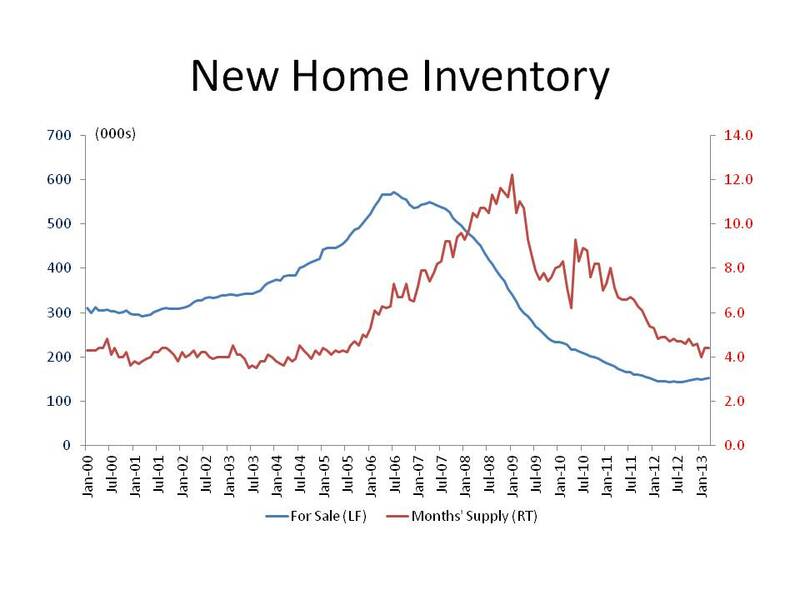 At the current sales pace, the inventory represents 4.4 month’s supply. The pace of new home sales is about half of a normal level as the industry and home buyers begin the long road back to equilibrium. Given the losses in the infrastructure of the industry, this modest recovery pace is both what is to be expected and what can be managed until more resources such as labor, lots and building materials return to home building.